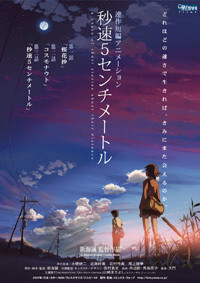 Crunchyroll - Forum - Watch Makoto Shinkai's Works! *UPDATE: These titles are available worldwide except Japan. We hope you're enjoying your live stream direct from NYAF/CC 2011! Mr. Makoto Shinkai is a special guest and in honor of his appearance, we'll be streaming his works: 5 Centimeters Per Second, Voices of a Distant Star, and Place Promised in our Early Days for one week. "Lights will guide you home and ignite your bones... and I will try to fix you." Gonna watch them again. Wha... Five Centimeters Per Second was available before in my region. Now it's not? Voices of a Distant Star was so sad and beautiful I am tearing-up just remembering it. Poi is the new Desu! Cool, more videos that are unavailable in my region (RoW). I'd say 98% of them are this way. Say... do I have a slightest reason to ever buy premium membership? To watch Gintama in HD? I watched 5 Centimeters Per Second last time it was available on CR and loved it. Can't wait to watch these other two! Thanks so much! No. I do not want to be your friend. Awesome. Any chance of getting 720p?